Ever feel like your headjoint has mysteriously become harder and harder to fit smoothly into the barrel? It may seem perplexing, but there is a very simple and likely culprit that can really make the headjoint excessively tight. What might it be? Grime! Headjoint tenons and the flute's barrel can accumulate all kinds of dirt and grime from everyday wear and tear. 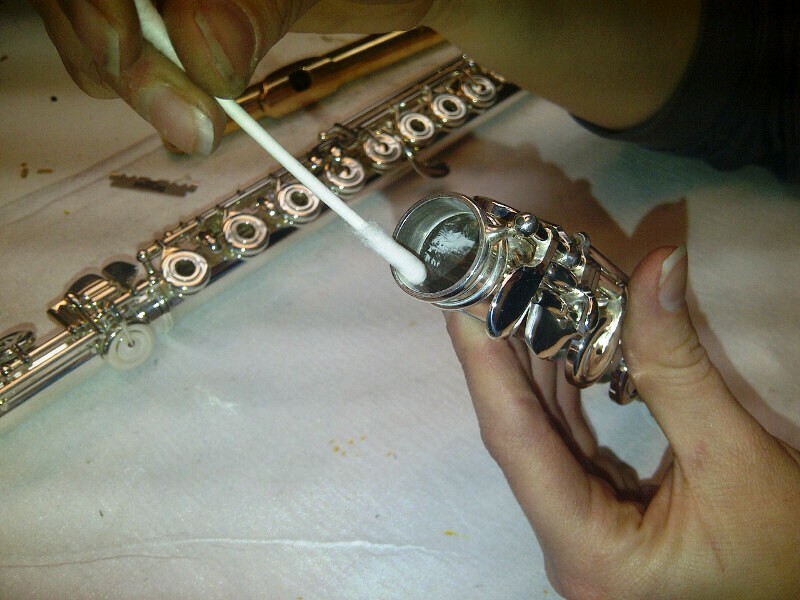 As things get dirtier and it becomes harder to assemble the flute, some people are prone to grease up the headjoint tenon with something like cork grease or other lubricating oils and creams. Don't do it! The creams, greases, and oils will build up on the tenon and inside the barrel, attracting more dirt, dust and grime. If it becomes difficult to assemble the flute, forcing the parts together could lead to damage. So, make sure to keep your headjoint tenon and the inside of your barrel clean. What do you need for this? Well, just a simple, untreated microfiber cloth. To clean the headjoint tenon, simply wipe the outside with the cloth. For the inside of the barrel, cover your finger with the cloth and gently wipe the inside of the barrel. Tenon fit issues are not restricted to headjoints, though. Think about your body tenon and footjoint. Has it become increasingly difficult to put the footjoint on? Grime strikes this area as well – both on the body tenon and inside the top of the footjoint. Also, make sure to resist the temptation to put any type of grease, cream, or oil on the body tenon. Just as is the case with the headjoint tenon, these lubricating substances will attract more dust and dirt and then build up on the body tenon and inside the top of the footjoint. So, make sure to keep things from getting grimey. Keeping your tenons and the areas where they connect clean (inside the barrel and footjoint) is a simple strategy for helping your flute stay happy and healthy!